I have received a few emails about a new pizzeria in Tunkhannock, and a few friends who live around that area have been bugging me to get out and review the new Carm’s Pizza House so I figured let’s get back on the circuit and see what all the hoop-la was about out in Wyoming County! For this review, I went along with my first lady for a quick dinner as she was one of the people bugging me to try the pizza. We took a ride up Tioga Street past Tractor Supply and headed up the hill to find that Carm’s was right on the main drag just on the edge of town. We walked in to find that the interior was sort of a modern country feel with plenty of space and a bunch of tables – all of which were different which was pretty neat. I noted that the place was very clean and comfortable including over-sized booths, large rooms which were open and not crammed, and several separate dining areas. 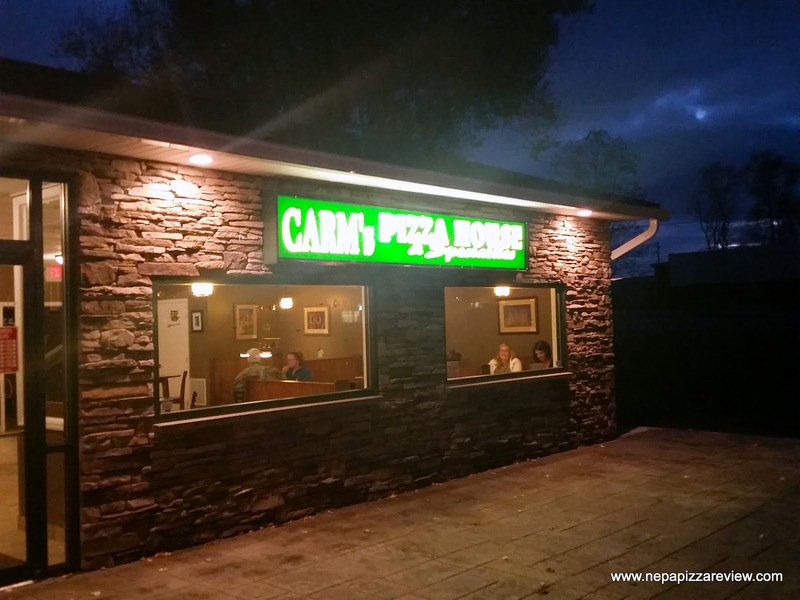 We sat down and took a look at the menu to find that Carm’s sells square pizza (think old forge crust) and a wide variety of appetizers, salads, sandwiches, and burgers. I was intrigued by the square pizza, hopeful that it would be unique and made from fresh dough. 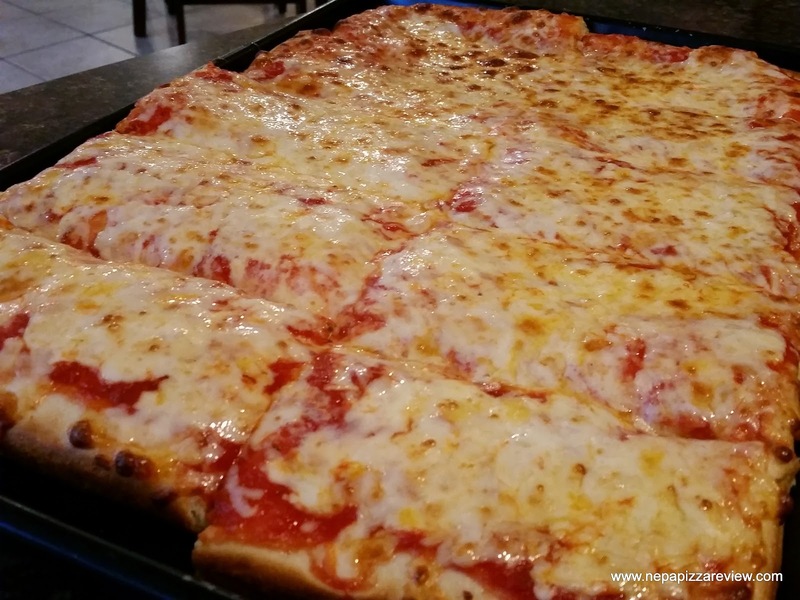 Since Carm’s serves Stromboli and Double Crust pizza which are both typically made from fresh dough, I thought my chances of receiving it on the traditional square was pretty good. We ordered the classic 10-cut square pizza at a price of $13.95 and we also decided to try an order of 12 mild wings for $8.95 since it has been so long since we went on a pizza review! The food was ready for us in no time. We thought that the wings were pretty good and flavorful, but I’ll leave that up to the NEPA Wing Men to decide how good! 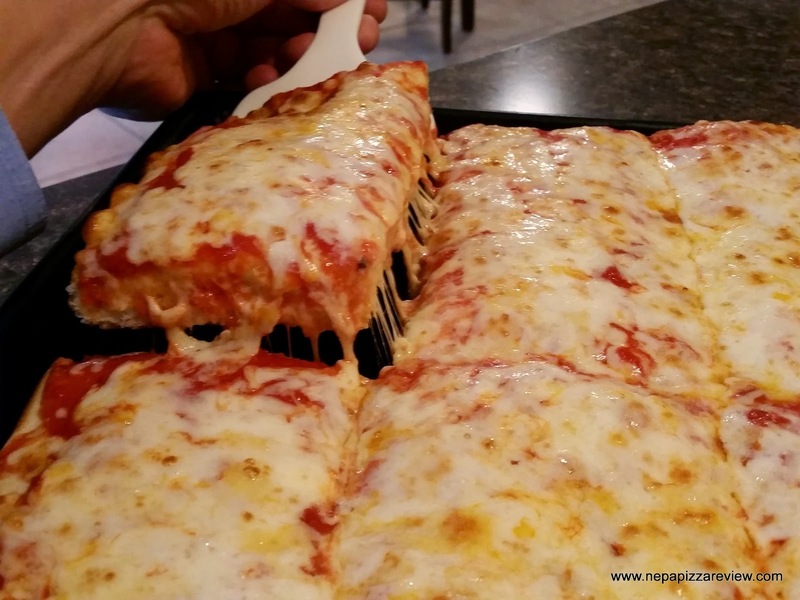 The pizza came out and looked to be your pretty standard “square” (rectangular) pizza with a premade or precooked crust. I couldn’t tell if the shell was store bought or not because it was quite fresh, but the consistency and chewiness made me think it might have been. Nevertheless, the crust was tender, slightly chewy, and of a medium density. It was cooked to a light brown on the bottom but was not crispy (by design I imagine). The sauce was simple, slightly sweet, slightly bitter with a light seasoning blend that worked nicely. The cheese was a blend of something smooth and cheesy, but I couldn’t venture a guess at what it was as there were no flavors that really stood out to give the cheese’s identity away to me. Overall, I’d have to say this pizza was decent. The first lady and I enjoyed the meal, restaurant, and service and I would definitely go back, but I probably wouldn’t order that pizza again at a $14.00 price tag. I encourage you to go give Carm’s a try because it really is a neat little place with good service. Please let me know what you think in the comments below or hit me up on my facebook page!